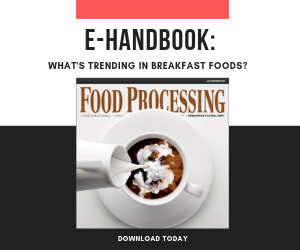 Breakfast may indeed be the most important meal of the day for food processors looking to put their money where their markets are going. Beyond the traditional realm of cereals hot and cold, recent breakfast product innovations include complete entrees, sandwiches, wraps, bowls and pancakes – some wrapped around sausages on a stick. Big-brand marketers are developing those products in more healthful ways while taking a page from the fast food handbook to offer innovation, flavor and convenience. But there's so much novelty in this category that new processing and packaging machines are essential to compete. "We have seen a big increase in our business for machines related to breakfast sandwiches," says John McIsaac, vice president of strategic business development for Robert Reiser & Co. (www.reiser.com), Canton, Mass. "For us, this means an opportunity to produce machines for the components of the sandwiches." That means machinery ranging from patty formers to English muffin dividers to machines that slice and accurately place cheese on breakfast sandwiches, most of these integrated into larger lines. The reason is the simple and ongoing truth that "Americans want to eat breakfast sandwiches they can microwave," he says. The products getting the most attention are fully cooked, frozen and convenient. Despite, or perhaps as a response to, the recession, top brand marketers are focusing more on brand building and less on loss-leading commodities that are prone to undercutting by private label competition. A Robert Reiser-supplied Vemag Cheese Slice Depositor drops cheese onto a "moving target," such as a sausage patty or breakfast sandwich. Hormel long has been a low-price competitor, but it discovered a way to command a higher price for former commodity products by forging a link between health-oriented marketing and processing. Its 2006 investment in "TrueTaste" high-pressure processing, which uses pressure, not heat, to pasteurize food, preserves flavor and extends shelf life without preservatives. The first products were deli meats, but now Hormel has Natural Choice-branded bacon and fully cooked sausage. Kraft Foods exemplifies the need to focus on brands and not commodities. In 2008, in the face of a still-new economic crisis, the company launched its Bagel-Fuls brand. The bagel and cream cheese sandwiches help add value to slicer-thin cheese margins and address consumers' needs for breakfast, "one meal occasion they really struggle with," Chitra Ebenezer, director of marketing and now director of consumer cohorts, said in launching the line. These were seen as part of a "quick-meal" category designed also to target consumers seeking to pare-down their out-of-home meal spending. Reduce or combat commodity items with higher-value branded products. Create products suited to claims of health and nutrition. Deliver products and packages with greater convenience. Enhance plant flexibility and responsiveness to changing consumer needs. Do all of the above faster, with higher quality and fewer resources. Jimmy Dean's parent, Sara Lee, typifies much of this industry zeitgeist. For example, a continued phase-out of its kosher and commodity meat businesses has been accompanied by brand building. In its second-quarter earnings report (announced in February), Sara Lee's North American retail business – including the Ball Park, Hillshire Farm and Jimmy Dean brands – saw operating margin rise 6.5 points to 16.4 percent, and income jump 66.6 percent to $122 million, compared to the same period in 2009. While some of the revenue improvement came from cost-cutting, Jimmy Dean frozen, fully-cooked sausage, Breakfast Entrées and Breakfast Bowls have been lauded by top management since 2008. The same February earnings report noted that Jimmy Dean increased its share of the "frozen protein breakfast category" in North America by 2.4 points to 54.3 percent, according to Information Resources Inc. data. Sara Lee's Jimmy Dean brand has steadily updated its portfolio with cooked, microwavable Heat'N Serve sausages, microwavable Entrees, Omelets, Breakfast Sandwiches and Bowls, 10-minute "Skillets" kits and Pancakes & Sausage – even pancake-wrapped sausage links on a stick. Additionally, "D-Lights" products such as bowls and sandwiches tout reduced calories and fat as well as being an "excellent source of calcium and protein, and a good source of iron." How these companies and others succeed in bringing such innovations to market relies in no small part on the ability of suppliers to accommodate the technical demands they necessitate. Current-generation equipment solutions have new features that include updated recipe-selection and management software for accurate processing and quick changeovers; modular designs that smooth line modifications; and quick-connect hardware to minimize tools and speed maintenance and production changeovers. "For a long time, breakfast has been the hottest segment of the food industry," says Andrew Parlour, strategic account manager for Kliklok-Woodman Food Packaging Machinery (www.klikwood.com), Decatur, Ga. For plants that must ensure maximum uptime and smooth production flow, redundancy is the watchword. "We've done a lot of work in the breakfast arena, especially in the last two years. Customers are investing in additional equipment for excess capacity, just to make sure that, if there's a hiccup on a piece of machinery, the line never stops." For example, the company has provided extra capacity with redundant installations of cartoners "for multiple customers in the category" producing frozen breakfast sandwiches, entrées and more. The units typically run in tandem, ramping-up or -down speeds so that processing and packaging lines are in-synch. He explains that when multiple lines are running side by side at 100 cartons per minute, if one of those legs goes down, product is diverted to the other line, which can then run twice the product at 200 per minute. Equipment flexibility and adaptability is critical for tackling new and expanding applications in a cost-effective manner. "Versatility is key," says Christine Banaszek, application engineer at Charles Ross & Son (www.mixers.com), Hauppauge, N.Y., maker of mixing and blending equipment. To handle the varied sizes and densities of mixtures, vendors must "provide the proper piece of equipment but without over-engineering," she says. "If a customer intends to use one blender to make several formulations, the machine features must accommodate the customer's expectations in terms of clean-ability, flexibility in working volumes, heating/cooling requirements, controls [and] integration with upstream and downstream equipment." Despite their slow adoption of automation technology, processors work closely with and drive incremental innovation in mechanical systems. Customer-driven blending equipment upgrades at Ross, Banaszek says, have included high-speed choppers for breaking up agglomerated powders, liquid spray bars with nozzles for adding minor liquid components, lantern rings on the stuffing boxes to air-purge and prevent any fine materials from entering the shaft seal, jacketed vessels for heating or cooling and vacuum designs. Kliklok-Woodman's Parlour notes that new screw infeed conveyors, used for endload cartoner applications, better ensure that each flight of a conveyor chain is populated with product, which "dramatically" increases the efficiency of packaging equipment. The design was partly inspired by the screw conveyors used on bottling lines upstream of the filler. "The user can run the machine and in-feed at the same rate," he says, "for any product that needs to be ‘singulated,' especially in a rigid container such as trays of frozen entrées [or] even round bowls." Heat and Control (www.heatandcontrol.com), Hayward, Calif., in February debuted a new horizontal blending conveyor that mixes and maintains multiple snack, cereal or frozen food ingredients using load cells that keep the mix accurate to 2-4 percent as the product moves to packaging stations. Compared to vibratory conveyors, the company claims product breakage reductions up to 60 percent with less ingredient separation, coating loss and conveyor-pan buildups for cleaner operation and less downtime. Also in February, the company announced a compact, five filling-head tray sealer that accommodates manual loading or can be automated to seal 200 trays per minute. Like its bigger siblings, it has options for handling liquid products, MAP gas flushing or vacuum-gassing, and the integration of inspection and checkweighing equipment. In addition to machines related to breakfast sandwiches, Reiser is seeing higher sales of systems for "skinless" breakfast sausage, which convey product 28 links across and fill an oven belt completely with exact-weight sausages, says McIsaac. Recent innovations in sausage-making machines have combined separate processes for stuffing meat into casings, freezing them and then cutting them with a slicer into a single machine. Mechanical steps also are integrated in Reiser's high-speed slice-depositors, which cut cheese blocks into exact-weight slices and precisely place them on a moving target – such as breakfast sandwiches being assembled on a conveyor. All these mechanical processes are, of course, somewhat automated so that cheese or other ingredients can be sliced, placed, cooked, conveyed or otherwise advanced through the process with speed and accuracy – as well as safety, where human intervention introduced microbial risk. Heat and Control's tray sealer, for example, uses software recipe management, equipment automation and robotic hardware, and helps streamline human processes with an "Intelligent Tool function" that instructs personnel on the specific tools they need to cart to the unit to accomplish a changeover in just a few minutes. "Automation is the last frontier," Kliklok-Woodman's Parlour says, adding that the company is measuring "just crazy numbers" when comparing traditional technology to today's systems. For example, citing rapid servomotor-based setups and changeovers on cartoners, he says that in some cases on older lines, "It was not uncommon for operators to spend four or six hours setting-up and dialing-in settings that today take minutes. Today, users can achieve changeovers in two or three minutes with the push of a button. The process is repeatable and at an ongoing, automated pace. And that doesn't just apply to us – these kinds of advances are evident across the board among vendors on the higher end of the industry." As Food Processing's own research shows, automation is near the bottom of the list as a capital spending priority, per our 2010 Manufacturing Trends Survey. Still, there is plenty of room for productivity improvements going forward; fewer than 12 percent of plants reported automating their entire processing lines, or their packaging lines, end to end. Never mind the benefits to come when entire plants are integrated and connected to the business office.